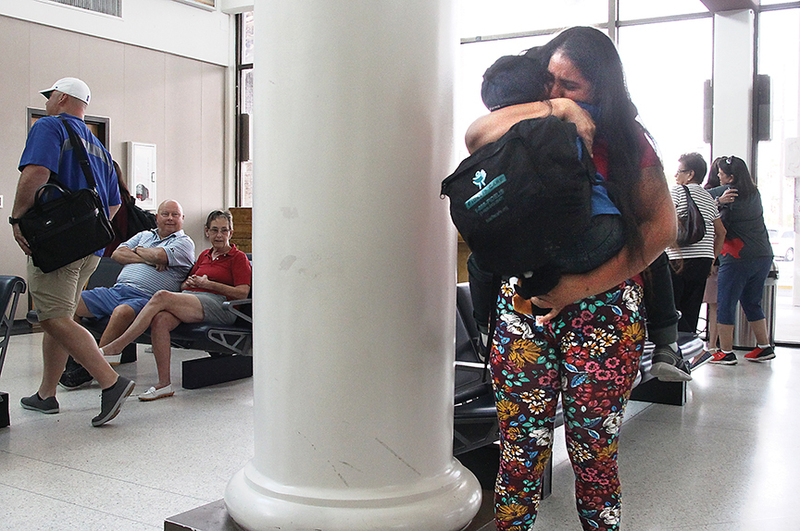 Dunia, who came to the United States fleeing violence in Honduras, wipes tears from her eyes after being reunited with her 5-year-old son, Wuilman, at the Brownsville – South Padre Island International Airport last Friday. Editor’s Note: To jump to Part 2 of this story, click here. 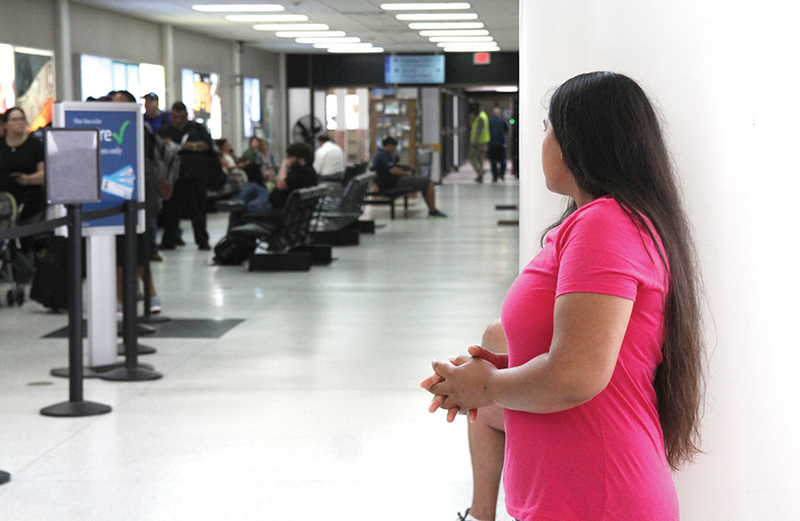 Dunia stood with her hands clasped at her waist, fingers interlaced, looking past the long line of people who had recently arrived at the Brownsville – South Padre Island International Airport Friday morning. She was anxiously awaiting the 10:42 a.m. arrival of an American Airlines flight from Los Angeles, where her 5-year-old son had been taken by government officials after the pair had been separated in Texas. “Me siento muy feliz, muy feliz y dándole gracias al Señor porque es algo que el Señor me ha permetido ver a mi niño,” Dunia had said just a few moments earlier. “I feel happy, very happy, and I give thanks to God because this is something God has allowed — for me to see my son,” she said. Dunia, 24, came to the United States from Honduras, hoping to flee drug violence that had been visited upon her family. Her father, Genaro, and 17-year-old nephew had been killed by narcotraffickers, she said. Afterwards, she said her family could not leave their home for fear the criminal gangs would find them. She began her journey sometime in May, she said, bringing with her her 5-year-old son, Wuilman, and 8-year-old niece, Katie. Dunia’s sister had come to the U.S. several years before and had asked Dunia to bring the girl. They traveled by bus, a decision which Dunia said spared her and her small family much of the suffering she had heard other migrants had experienced. But one thing she hadn’t heard of was of the United States’ new policy of separating children from their parents, even those who were seeking asylum. She learned of the new policy the hard way, when she arrived in Texas in mid-June. Dunia doesn’t know where she crossed the border. Even government documents list her crossing as at an “unknown location.” All she knows for sure is that she was taken to a detention center in McAllen, known to detainees as “La Perrera” — the Dog Pound. To the best of her recollection, she arrived on the evening of June 11. The following day she was transported to an immigration court. Officials told her she would be reunited with her son once she returned to the detention center. “Me dijeron que después de la corte, pues, yo iba a regresar con mi niño, y no fue así,” Dunia said. She didn’t know where her son had been taken, or her niece. It wasn’t until her sister began to investigate that Dunia learned her son had been taken to a facility in Los Angeles, while her niece — considered by the government to be an unaccompanied minor — was taken to a different facility in New York. It was several weeks before Dunia was able to communicate with her son, and that, too, was thanks to the efforts of her sister. Dunia said she wrote multiple letters to immigration officials pleading for information or communication, all of which went unanswered. She estimates it was 22 days before she finally was able to speak to her son on the phone. By then, she had been transferred to the Port Isabel Detention Center on the outskirts of Laguna Vista. Wuilman was desperate and repeatedly asked her when she would come get him, she said. “De verdad, que fue algo que no podía sorportar. Es muy duro, verdad? Es muy duro estar separado de mi niño. Es muy duro,” Dunia said. “Truthfully, it’s something I couldn’t stand. It’s very hard, you know? It’s very hard to be separated from my son. It’s very hard,” she said, adding that the pair had never been separated before. But, help was soon to arrive to Dunia and to several other mothers and fathers being held at the Port Isabel Detention Center, identified by the Trump administration as one of the “reunification” centers for separated families. A federal court mandated that families be reunited by Thursday, July 26. 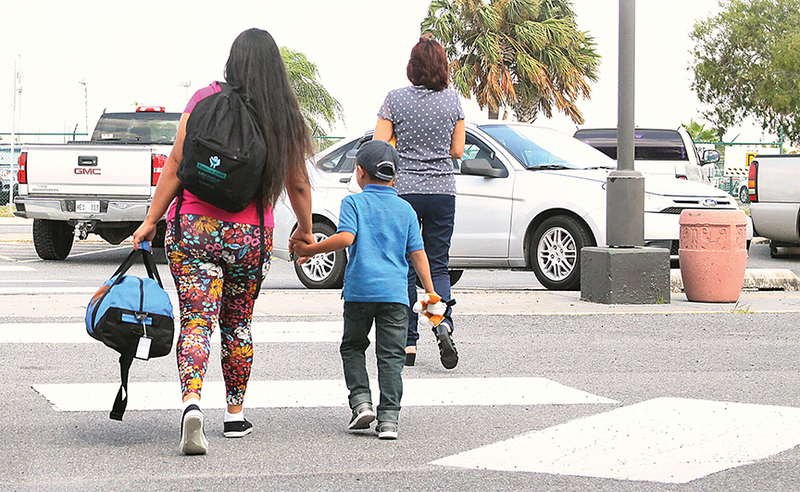 A group of Laguna Madre locals, angry with the child separations, began to organize in June, hoping to help these immigrant families. With the help of immigration attorneys who regularly visit the detention center, they began to collect information and raise funds for bail, travel and living necessities. Calling themselves Angry Tias and Abuelas, the group began to make visits to the detention center. Eventually, the group was able to help Dunia be released from the detention center and ultimately partnered with the Los Angeles agency which was caring for Wuilman — Nuevo Amanecer Latino Children’s Services (NALCS). Messages left with the California-based adoption and foster agency went unreturned as of press time Thursday. With Dunia freed from the detention center, Angry Tias and Abuelas delivered her to La Posada Providencia, a refugee shelter located in San Benito. The following day, representatives from NALCS had reached out to coordinate travel arrangements for Wuilman. And by Friday morning, the young boy was aboard a plane to be reunited with his mother. Wuilman had a huge smile on a his face as he ran towards his mother in the airport lobby. She scooped him up in her arms, hugged him tight, and cried for several minutes, oblivious to the crowd of people around her. Afterwards, she returned to La Posada with her son, where they shared a communal meal with other refugees and asylum seekers. Wuilman smiled and laughed, playing with a small stuffed animal given to him by a reporter from Rolling Stone. But, of the past few weeks, the boy was reluctant to speak, preferring instead to draw on the sketch pad with markers the Rolling Stone reporter had carried with her. Dunia was mostly quiet, a thin smile on her face as she watched her son. She thanked God again for being reunited with her son. “Es algo que esperaba tanto,” she said. 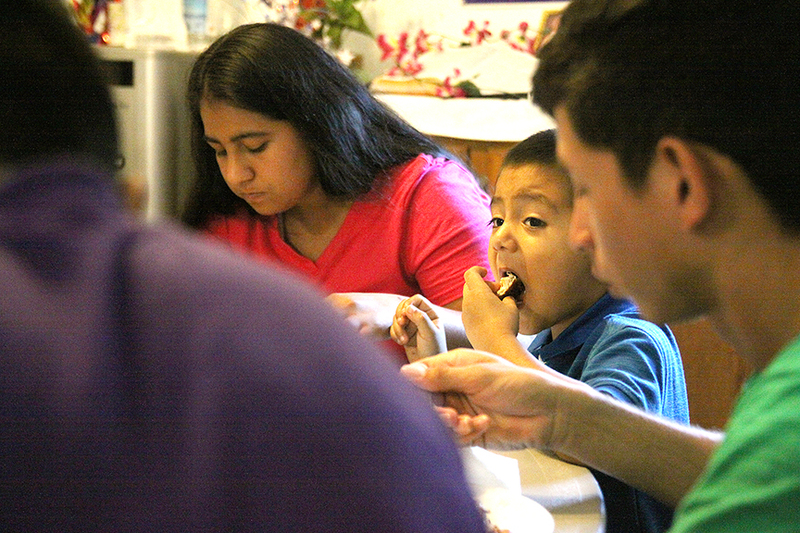 Dunia, left, and her son, Wuilman, share a meal together for the first time in over a month at Casa Providencia in San Benito Friday. South of San Benito, among agricultural fields and a smattering of rural homes hidden behind pasture fences and scraggly mesquite trees that press close to the road, La Posada Providencia provides a place of safety for people who have traveled far to find it. From there, a paved driveway just wide enough to accommodate a single vehicle leads visitors towards a cluster of clapboard buildings surrounded by tidy green lawns and shade trees. Behind them lies the same resaca that wends its way languidly through the heart of San Benito. Though it’s not far from the bustle of town, La Posada Providencia exudes a rural quietude. It’s peaceful and serene — just the place for refugees and asylum seekers looking for respite from what may have been long and treacherous journeys. It serves as a way station where they are welcomed with kindness, meals made with love, a safe place to sleep. A sign on the lawn marks one of the buildings as the office. Inside a back room, voices and laughter fill the air, mingling with the savory aroma of the freshly made food set out on serving dishes lining the counters of a small kitchen. It’s lunchtime. Approximately a dozen people sit at two large round tables enjoying a homemade meal of pan-fried fish fillets, white rice, green beans and buttered toast. At the farthest corner of the room sit Dunia, 24, and her 5-year-old son, Wuilman. Dunia eats quietly, occasionally stealing glances at her son and smiling. Wuilman lifts a plastic tumbler filled with sweet tea to his lips, his bright brown eyes peering over the rim of the glass to look at the people who aren’t sitting at the tables eating — reporters come to document a vignette in the larger immigration story unfolding nationwide. As he finishes his meal, a mischievous smile flashes across his face just before he cajoles the digital camera from a photographer who had been standing near him. In seconds, he is conducting an impromptu portrait session with the small stuffed animal sitting on the table in front of him. He lifts the camera up so his mother can see the resulting image on the LCD screen and she smiles again. It’s an easy smile. One without worry. It’s the first meal they had shared together in over a month. 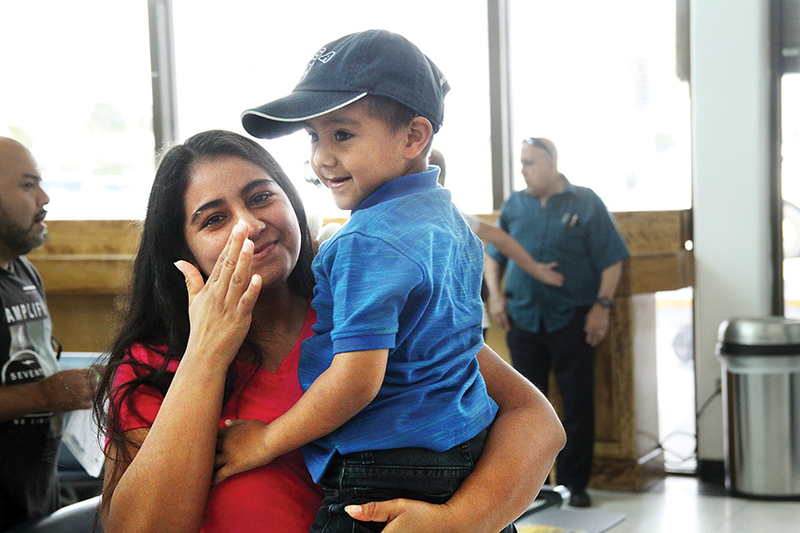 Only hours before, Dunia had been reunited with her son at the Brownsville – South Padre Island International Airport after having been separated from him since the middle of June. But the story of how Dunia and Wuilman had ultimately arrived to the safety and tranquility of La Posada, sharing a meal with other asylum seekers and refugees from all over the world, is a convoluted one. Dunia first arrived at La Posada last Wednesday evening — June 18. However, she wasn’t brought there by an immigration attorney. Nor was she brought there by federal immigration enforcement agents. Instead, she was dropped off at the refugee shelter by a member of a relatively new grassroots organization that calls itself Angry Tias & Abuelas of the RGV. “She was dropped off and she wasn’t sure who was helping her,” said Andi Atkinson, executive director for La Posada Providencia. Atkinson added that Dunia and her son were the first migrants brought to the shelter by Angry Tias & Abuelas. Atkinson’s comment about Dunia not knowing who had been helping her underscores the confusion, disorganization and chaos that has surrounded the plight of migrants in the wake of the Trump administration’s “zero-tolerance” policy. Attorney General Jeff Sessions directed U.S. Attorneys along the southern border to escalate “effort(s) to prosecute those who choose to illegally cross our border,” Sessions said via a statement released on April 6 of this year. The policy went into effect on May 5. As migrant families crossed into the United States, adults were referred for criminal prosecution for their alleged illegal entry into the country. Meanwhile, their children were placed into the custody of the Health and Human Services’ Office of Refugee Resettlement. By mid-May, hundreds of children had been separated from their parents under the new policy. President Donald Trump was quick to blame the family separations on Democrats. “Put pressure on the Democrats to end the horrible law that separates children from there (sic) parents once they cross the Border into the U.S.,” Trump tweeted on May 26. However, there is no law that requires the separation of migrant children from their parents. Nor is it a crime to request asylum. Too, entering the country unlawfully for the first time is a federal misdemeanor subject to civil penalties, not criminal ones. Prior to the zero-tolerance policy, adult migrants referred for detention to await criminal prosecution were sent, under directives from the Obama administration, to family detention centers with their children. In particular, many were sent to two Texas facilities — the Dilley Family Residential Center south of San Antonio, and the Karnes County Residential Center in Karnes City — beginning in 2014, when federal officials began to report a spike in the number of Central American women and children crossing into the country from Mexico. It wasn’t long before immigration policies under Trump — who often spoke during his presidential campaign of building a wall along the United States’ southern border, and implied an inherent criminality of Latino migrants by calling them criminals and rapists — began to become noticeably harsher. Indeed, one of the first indications of the coming shift towards pursuing the criminalization of unlawful entry into the country came in 2017 when John Kelly, then secretary of the Department of Homeland Security, announced the administration was looking at using family separations as an immigration deterrent. Kelly currently serves as White House Chief of Staff. “I would do almost anything to deter the people of Central America from getting on this very, very dangerous network that brings them up through Mexico into the United States,” Kelly told CNN’s Wolf Blitzer during an interview on March 7, 2017, a little more than a year before Sessions would go on to announce the zero-tolerance policy. “Yes, I am considering — in order to deter more movement along this terribly dangerous network — I am considering exactly that. They will be well cared for as we deal with their parents,” Kelly said when Blitzer again pressed him about whether the administration was considering separating families. Within two weeks of the zero-tolerance policy’s May 6 implementation, 658 children had been separated from their parents, according to Richard Hudson, a senior official with Customs and Border Protection, who testified at a Senate Judiciary Committee hearing in late May. Public outcry to the practice was swift and loud. On June 20, Trump signed an executive order halting family separations. “It is also the policy of this Administration to maintain family unity, including by detaining alien families together,” the order reads in part. The following week, on June 27, U.S. District Judge Dana Sabraw issued an injunction requiring the federal government to reunite the families already in its custody by a certain timetable. For children under 5 years of age, the reunification deadline was July 10. For children 5-17 years old, the deadline was this week — Thursday, July 26. Aid workers in the Rio Grande Valley prepared themselves for an influx of migrants. “Remember July 10th was the initial deadline to reunify families? We were expecting to receive a lot more people on that day,” said La Posada’s Andi Atkinson. Members of national and international media organizations descended upon the refugee shelter anticipating the arrival of reunified families, Atkinson said. But, the droves never arrived. Not even a trickle. Instead, a single family — a father and his son — wound up at the shelter on July 10, and that was a bit of an accident, Atkinson said. “It was a father and his son, and we were told that Border Patrol dropped him off at the bus station in Harlingen,” Atkinson said. People at the bus station, familiar with La Posada’s mission, called the shelter and asked if it could take in the father and son, who were scheduled to depart the following morning. Atkinson said shelter staff brought the pair to the shelter for the night, then transported them back in time to catch their bus. Back in the Laguna Madre communities, local activists had been growing increasingly alarmed by the family separations. “Angry Tias formed probably in early June when this thing first came up about separating families and people waiting on the bridges,” said M, a member of the Angry Tias & Abuelas who asked not to be identified. M referred to another new practice which had been taking place at international bridge crossings throughout the Valley. The Texas Observer reported last month the practice involves federal agents positioning themselves near the halfway point on the bridges and preventing asylum seekers from stepping foot on U.S. soil to request asylum. “I had a friend who told me that she had met these people and they were saying we had to do something,” M said. Doing “something” began small, with the Angry Tias & Abuelas purchasing water, umbrellas and food for the people who languished — sometimes for days — in limbo on the bridges. The group also organized a small protest on the steps of the federal courthouse in Brownsville. “We — meaning about 12 people — were the very first ones to have an action protest at the Brownsville Courthouse on June the 14th,” M said. The group organized other actions, as well. They began to team up with immigration attorneys and other activists, trying to learn how best to put their efforts to use. They sat in federal courtrooms as court observers, trying to gather the names of as many migrants as possible in the hopes of offering their help. They began making in-person visits to people being detained at the Port Isabel Detention Center. The group learned as they went, overcoming frustrations every step of the way as they discovered a system in disarray. For instance, as part of their court observations they would request dockets in the mornings, before the sessions began, in order to obtain the names of migrants. But, once inside the courtroom, things were much different than they expected, M said. “All of a sudden, there’s 60 more cases that are going to be heard,” M said, which were not shown on the morning’s docket. The Angry Tias & Abuelas learned to request dockets at the end of the day, as well, in order to obtain more up-to-date information. At the Port Isabel Detention Center, they learned of a strict set of rules for visitors. Only one person at a time can visit a person being held there. Visitors are not allowed to bring anything with them, not even pen and paper. “You cannot take anything else but your car keys,” M said. Visitors and detainees sit separated from each other by a Plexiglas wall, forced to communicate through telephone handsets. “You speak by phone and the guards are listening in,” M said. In one instance, an Angry Tias translator who was visiting with a father being held at the detention center attempted to tell the man his phone number so that the father could stay in contact. “The guards cut (the translator) off and sent him out,” M said. Dunia, a 24-year-old migrant from Honduras, cries as she holds her son, Wuilman, just moments after being reunited with him at the Brownsville – South Padre Island Airport Friday. That’s when she finally learned Wuilman had been taken to Los Angeles, while Katie was classified as an unaccompanied minor and sent to New York state. The women were allowed only two sheets and a single blanket. They couldn’t wear a jacket unless they were sick, Dunia said. And women did fall ill.
During her time at the detention center, Dunia said she herself suffered an infection in her tonsils. Other women developed fevers. At one point, three of her friends came down with a stomach illness. They pleaded with the guards to see a doctor, Dunia said. “De las siete de la noche empezaron con dolor de el estomago, vomito, y nosotros les dijimos a la Miss que los llevaran al medico. … Y dijeron que si, pero pasó toda la noche,” Dunia said. “At around 7 at night, they started feeling stomach pain and vomiting, and we told the guard to take them to the doctor. They said yes, but the entire night passed (without the women seeing a doctor),” she said. The following day, the guards again offered to take the women to see a doctor, but by that point, the worst of the sickness had passed, Dunia said. Angry Tias & Abuelas eventually reached out to the Refugee and Immigrant Center for Education and Legal Services (RAICES), a Texas-based nonprofit organization which has raised over $20 million to help fund immigration legal services, including paying the bond fees of migrants being held in detention. When Angry Tias received word that another migrant was slated for release, volunteers would pick them up. That’s how the Angry Tias & Abuelas found themselves transporting Dunia to La Posada Providencia. M said detainees can be released anywhere from 6 p.m. to midnight. “If nobody’s there to meet them, they’re taken to the bus station,” M said. Federal agents leave the migrants at area bus stations without food, water, money or other supplies, M said, so the Tias stepped in to try to meet that need, as well, giving the migrants backpacks filled with supplies in the hopes of tiding them over during the long bus rides to the family or friends serving as their sponsors. “We give them a backpack to have at least the basic necessities. There’s water in there, snacks in there,” M said. “They have not a red cent to buy a meal in between,” she said. She estimates the group has filled approximately 750 backpacks, cleaning out at least one discount store of certain items in the process, M said. By the time an Angry Tias volunteer arrived, one of the young women had left. The volunteer was able to assist the second woman, just 20 years old, until her bus departed the following afternoon. As the July 26 reunification deadline loomed, however, the situation at area bus stations was getting worse. M said more and more migrants were being left to fend for themselves, in larger groups. “They have 70 or 100 people getting dropped off in McAllen,” she said. “It is so maddening that the government created this chaos and now is letting civilian organizations … take care of mopping up,” M said with noticeable frustration a few moments later. Dunia and Wuilman leave the Brownsville – South Padre Island International Airport. Angry Tias & Abuelas is just one of the newest organizations trying to fill those gaps. For La Posada Providencia, aiding refugees and asylum seekers has been their mission since 1989. But, even their years of experience in the immigration arena hasn’t inured them to feeling shock at the federal government’s harsher immigration policies. “Seeking asylum is not a crime in the United States, yet it does concern me that they, that when they do seek asylum, they are handcuffed and they are taken to detention centers that in every single way look just like jail,” Atkinson said. “When their children were taken away, that was even greater punishment, and so it concerns me how we’ve basically criminalized refugees. It concerns me greatly,” she said. For M, the family separations was the proverbial last straw that made an already struggling immigration system seem that much more intolerable and unjust. “I almost start crying when I see the buses going out there (to the Port Isabel Detention Center) because I know what’s going to happen and it’s been going on for so long,” she said, her voice quavering slightly. “And I never got involved before because I didn’t know how we were going to help,” M said. However, for the Angry Tias & Abuelas — after only about a month in existence, and having had to learn things, “by the seat of our pants,” as M described it — some of that feeling of helplessness has transformed into a sense of empowerment. “It makes us feel in a way helpless, but in another way, you know what, we are such a small group, we are handling more than we ever thought we could,” M said. Great Story! Glad to hear the family was reunited. And its great that our border security is working. Hopefully this article, illustrating that our government is enforcing the laws that are already in our books for decades, will be a deterrent to others who feel they can break into our country illegally. We need to make people more aware that there is a correct way to enter our great country. Thank you for this article, thank you ICE for doing your job and thank you President Trump for enforcing our laws! All of these news articles keep talking about what chaos these people faced after they got to the United States but none of them describe why they left their own countries. This is what needs to be understood and the conditions of those places described. People in the U.S. just think these people are coming to the states to get free welfare. Nobody is explaining why they left. This needs to be explained, graphically and in detail.